The Extra Heavy Recycled Mexican Blanket is extra bulky, making it one of the largest and softest yoga blankets available. Blankets will be seamed along the edge or border and will not have tassels. These bright, South West designed yoga blankets are made from 100% recycled fibers, and will add a splash of color to your yoga studio or your favorite place to practice yoga. These blankets are extremely heavy duty, weighing 5 pounds each. The recycled, man-made fibers make this blanket extremely soft to the touch. These blankets can easily and safely be washed in a regular washing machine. Use this blanket for warmth, comfort, extra padding, or to lend support for yoga positions. Each blanket is 82'' long by 62'' wide. 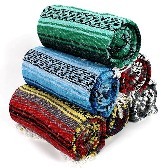 The blankets is available in assorted colors in a Southwestern Pattern. Heavy Thick & Soft Yoga Blanket:. • Cotton & Acrylic Blend. • 82'' x 62'' . • Available at 5 Pounds. • Nice & Very Soft. • Machine washable & Tumble dry. • Available In A Assortment Of South West Color Patterns. Heavy Thick & Soft Mexican Blanket. The bright, beautiful Thick & Soft Yoga blankets will add extra padding while practicing yoga. These high-quality Mexican blankets feature a plaid deign with a seamed border, these blankets do not have tassels. These blankets can be washed in a regular washing machine. Use this blanket for warmth, comfort, extra padding, or to lend support for yoga positions. Blankets can also be used for a picnic or a heavy bedding blanket. .